Notes: Word to the wise: though the pattern doesn’t call for it, make and wash a separate double moss swatch. This is mostly for the row gauge. When I finished the back and left front, blocked and sewed them together, I realized that the double moss section grew…a lot! It was saggy and most unflattering. I had to frog those sections and reknit them. Be sure to bind off the collar loosely so that it will lie properly–I had done mine too tightly and had to go back to redo it. I was able to use 1 skein of yarn less than what the pattern had indicated. For the buttons, I used La Mode 1151. 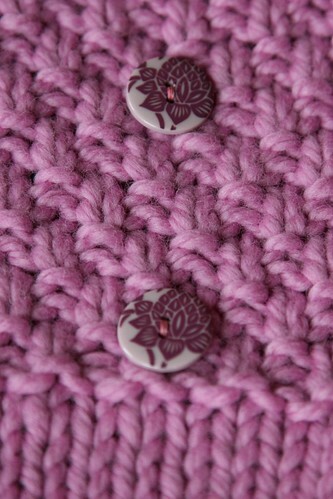 I put snaps on the underside of the buttons, which the pattern calls for, but they are not that easy to open and close. In retrospect, a possible alternative may have been to sew smaller (clear) buttons on the underside of the decorative buttons and just fasten them through the holes that are naturally in the fabric.